When was the last time you saw something on your plate and said it looked ‘too good to eat’? Usually intended as the highest form of praise, this kind of comment makes me ever so slightly uneasy. As a bit of a baking perfectionist, I like my food to look beautiful, but it should also be inviting – I want people to see a dish and immediately lick their lips, grab their spoon and dive right in. That’s not to say I don’t have a lot of time for food that looks like an incredible work of art, but it really has to deliver on taste too. When I was little, my cake decorating options were limited to the contents of our family kitchen cupboards. Candied orange and lemon slices and tubes of synthetic tasting ‘Writing Icing’ were the height of sophistication, with a liberal scattering of silver balls featuring on pretty much everything I made, and Smarties were a favourite for creating brightly coloured borders on cakes. When I got a little older, thick veined leaves were picked from our garden, coated in chocolate then peeled away – a nifty Josceline Dimbleby trick for creating life-like chocolate leaves – but that was considered pretty fancy, and about the extent of my creativity. Nowadays there’s so much choice it’s almost overwhelming. Go online and you’ll find thousands of shops full of sugar paste and sprinkles, edible glitter and glue, moulds and cutters and all kinds of other amazing contraptions for creating the most incredible decorations. Head into a boutique bakery and you’ll find the same thing – masterpieces masquerading as cakes, too beautiful to believe they are edible let alone even think about eating. And of course, for every shop churning out these incredible looking confections, there’s a recipe book. When I received a copy of Peggy Porschen’s Boutique Baking to review, I’ll admit to being slightly concerned that it might all be a bit too much. So many of these books are filled with the most ridiculous recipes, requiring dozens of different pieces of equipment and hours of your time to try and recreate something that is clearly unachievable, but this book is anything but. While it does involve a fair few techniques and stages to each recipe, each is laid out so well, with straightforward, well explained steps, that I think even someone new to baking would find it a joy to work with. 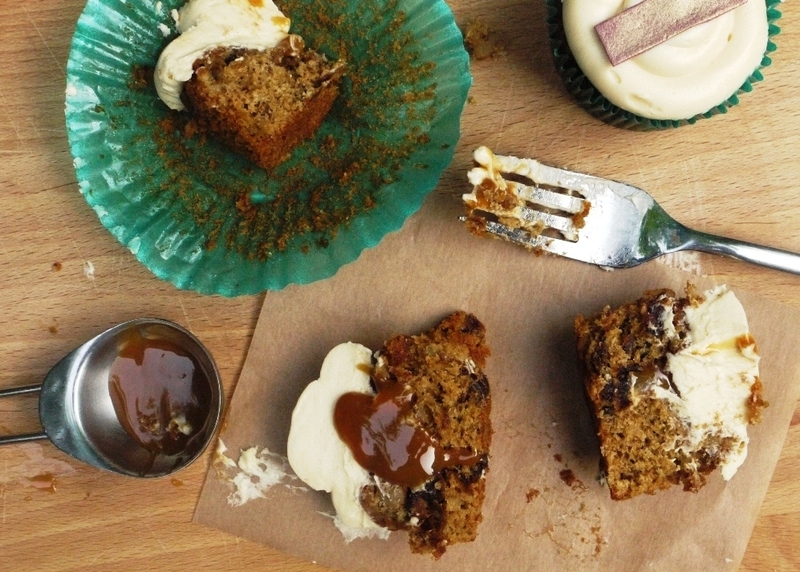 The recipe I decided to try first was these sticky toffee cupcakes. It’s testament to how enticing this book is that I decided on these first as I’m not even a particularly big cupcake fan – I always thought I’d take a rough and ready muffin or ugly squidgy brownie any day over a prim and pretentious cupcakes with its simple sponge base and overload of super sweet icing on top. But, dear reader, these aren’t just any cupcakes. They’re Peggy Porschen cupcakes. Apparently sticky toffee cupcakes are the bestselling item in Peggy’s bakery. I think I can explain why. Where an ordinary cupcake tends to consist of a slightly drab, dry sponge topped with tons of brightly coloured frosting, these have so much more to them. The cakes themselves are thick with rich brown sugar, sticky soaked dates and chopped walnuts for added texture and crunch. While still warm from the oven they are then soaked in a sweet sugar syrup – Peggy’s trick throughout the book for a super moist sponge and one I’ll definitely be repeating – before being hollowed out and filled with a core of creamy caramel. The whole thing is then topped off with a cloud of slightly tangy caramel cream cheese frosting to create a cupcake that looks utterly irresistible but definitely not too good not to dive straight in. Quadrille books have kindly given me permission to replicate the exact recipe below. It’s so delicious that I honestly wouldn’t change a thing, although if you’re not feeding a crowd of hungry colleagues (like I was) you might want to look at halving the recipe as twenty four cupcakes is a pretty hefty amount for any normal household. I’ve already got my eye on a number of other recipes from this gorgeous baking book, including lots of lovely layer cakes, some simple baked doughnuts and a batch of beautiful biscuits. Which even I might forbid anyone to eat if they turn out as pretty as Peggy’s . . .
Preheat the oven to 175 degrees C. Line two 12-hole muffin trays with cupcake liners. Place the chopped dates in a bowl and pour over the boiling water. Leave to soak for 20 minutes then drain (if there’s any water left) and break the dates into smaller pieces. Add the vanilla extract. Cream the butter and sugar in a mixing bowl until light and fluffy. Whisk the eggs lightly in another bowl then slowly combine with the butter and sugar mixture. If it starts to separate or curdle, stop adding the egg and beat in a couple of teaspoons of the flour mixture. Once all the egg is incorporated, fold in the remaining flour followed by the soaked dates and chopped walnuts. Stir until the batter is just combined then divide between the cupcake cases. Each should be about two thirds full. Bake for 15 – 20 minutes until the tops are golden brown and spring back to the touch. Remove from the oven. While the cakes are baking, bring the sugar and water to the boil in a small pan then simmer until all the sugar crystals have dissolved. Set aside to cool slightly. While the cakes are still warm from the oven, brush the sugar syrup over using a pastry brush. Once completely cool, chill the cupcakes for one hour, or until the cake feels firms to the touch. Then, using a melon baller or teaspoon, scoop out the tops of each cupcake. Place the dulce de leche in a piping bag and pipe into the scooped out centre of each cupcake for your caramel core. Beat the cream cheese in a mixing bowl until light and creamy. Beat the butter and icing sugar in a separate mixing bowl until very pale and fluffy. Add the cream cheese to the butter and sugar mixture a little at a time until combined. Add the dulce de leche, beat until combined then chill until set. 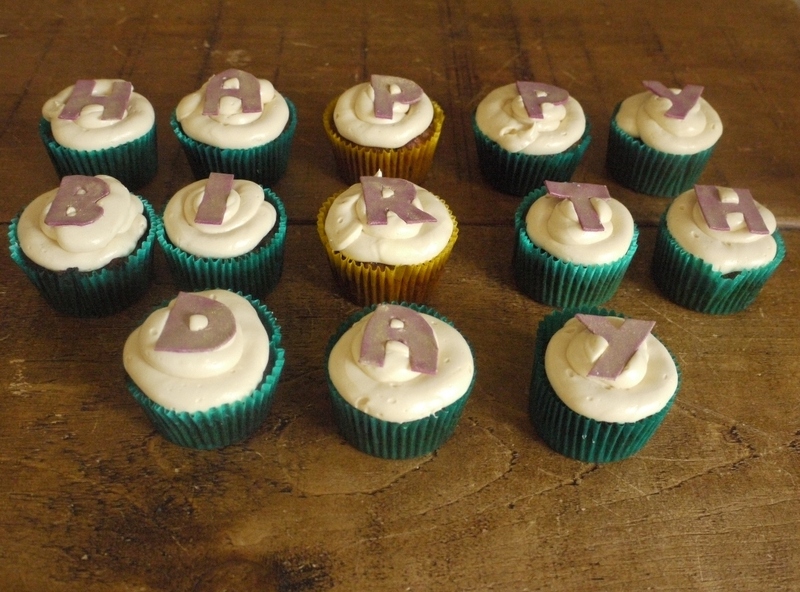 To frost the cupcakes, fill a piping bag fitted with a round nozzle and pipe a swirl of frosting on each cupcake. My decorations were made with purple petal paste, rolled out thin and cut into letters with a knife. I then left it to set hard before dusting with edible gold dust. These cupcakes are best frosted on the day you want to eat them – the cream cheese frosting means they should be stored in the fridge if not all eaten on the day, and I find cake always tastes a lot better at room temperature. These sound just so decadent with that caramel core and caramel buttercream – I’m not surprised they were a hit at work! Wow, these cupcakes look so amazing! That caramel core oozing out has made my mouth water. I can see why these are the most popular items in her bakery. I saw ‘sticky toffee’ and I didn’t even need to read the rest. These sound divine. I’m also not a huge cupcake fan for the reasons you state, and I never understood why they were so trendy. BUT, if the cake has real flavor and the frosting is added with restraint, I’ll gladly eat one. Usually the less ambitious looking ones taste best. Sticky Toffee Pudding is one of my favorite desserts, and I would love it in this form! They look incredible! Do you use any particular brand of dulce de leche, or do you make your own? I have always wanted to make some but I have never been sure where to start. Definitely have to try this recipe regardless, I always have to order sticky toffee pudding if it is on the menu, even in summer…! Kathryn – it’s absolute caramel and toffee overload, but in a totally good way. Jennifer – thank you. I’ve never actually been to Peggy’s bakery – definitely need to go soon to see how her version of these cupcakes compares! Annie – there’s a recipe on David Lebovitz’s site which I use all the time http://www.davidlebovitz.com/2005/11/dulce-de-lechec/ Otherwise, I like the Confiture de Lait that Bonne Maman make. Hope that helps! I am so much like you – I prefer cake or brownies to fussy cupcakes and the simpler the better – I’m not sure what my family would do with something pretty and over decorated. But these look perfect! And oooh anything filled with caramel makes me happy! I first made sticky toffee pudding almost a decade ago; once I realized it really wasn’t a pudding at all! Since I’ve had a love affair with the date laden, caramelicious treat…topping it with cream cheese frosting is over the but I love it top! ooh these look so good! I made some similar a while ago with salted caramel buttercream, a dangerous combination as I want to eat them all! I think I might have said that to you myself, uh oh. It is true though, I always have a deep admiration for all the baking blogs out there, the food always look simply gorgeous, too perfect to tuck into. I’m not the best baker, so I only dare do the simplest things, brownies, muffins and loaf cakes, things I don’t even show people but happily greedily tuck into myself. wow these look amazing!! I never used to like sticky toffee pudding but recently my tastes have changed. I’ve made these cupcakes once before and they were good but these look out of this world especially with the caramel oozing out. Drool! Oh goodness these are beautiful… but not too good to eat. 😉 I do still have those individual sticky toffee pudding cakes of yours on my to-make list though. Ah, always so much to cook! 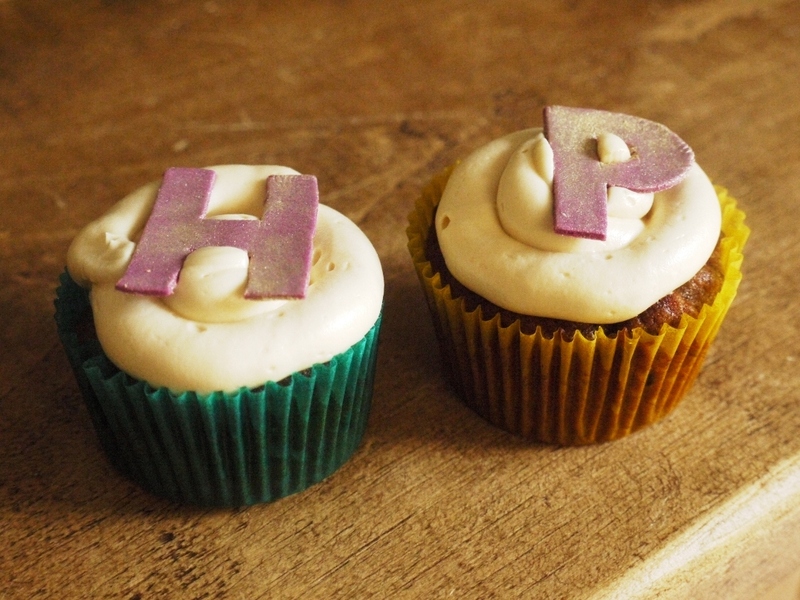 Barbara – haha yep, these cupcakes are anything but understated! Helen – salted caramel buttercream is so good – you could definitely substitute it here. Shuhan – haha, thank you! Fleur – you definitely should! Amy – ooh yes, do make the actual puddings themselves too – so yummy! I love anything sticky toffee, especially because I love dates and these cupcakes look fantastic. A few bites of gooey heaven is just perfect! I have to check out this cookbook! Boutique Baking is so gorgeous isn’t it! I fell in love with so many of the recipes but you’re right, they’re not that simple. This looks great! Oh my goodness these look fantastic! 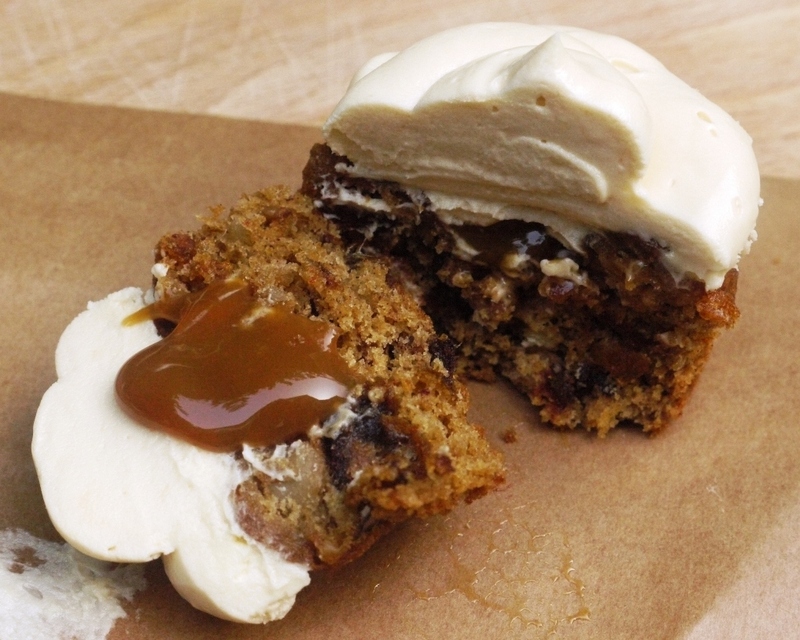 I love my Mom’s sticky toffee pudding at Christmas, so I will have to give this recipe a try. I love cookbooks with their glossy pages and perfect photography. How did you start getting cookbook publishers to send you cookbooks to review? Those look soooooooo good! I wish I had one right now. I know what you mean about being overwhelmed. Several times I’ve gone to order decorating supplies and not finished my order due to having far too much choice. These cupcakes look soooo good, I’d really like one now. Lisa – you definitely should, there are tons of other gorgeous recipes in it. Lorraine – thank you. And yes, so many more recipes in it that I want to try! Leslie – thank you. Usually the publishers will find your blog and email you to see if you’d like to review their books. Or follow them on Twitter and sometimes they do giveaways! 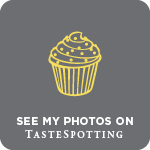 Elaina – I need sprinkles in the shape of dinosaurs in my life, they sound amazing. P.S. I Love Soap – me too! Yum – I have seen that book around on teh internet but must get a copy as these look divine! Oh these do look delectable indeed. Just the thought of that caramel oozing out of the centre has me swooning. I made some sticky toffee cupcakes that were good, but they are as nothing to these amazing creations. Yum. I made sticky toffee pudding cake for the first time while I baked at a coffeehouse, and the staff and I ended up eating all of it, it was so good. I love it in cupcake form!! Choclette – thank you! I think it’s the caramel centre and addition of nuts and dates that really sets these apart. 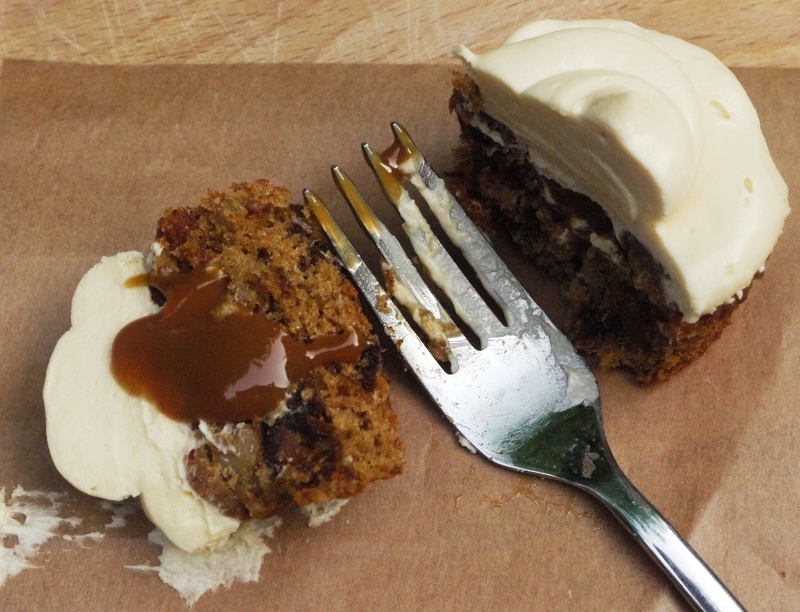 Sarah – sticky toffee pudding is so delicious. These cupcakes are a little less heavy, but just as rich! Is it light brown or dark brown Muscovado that is to be used? Just made the marzipan autumn leaves that top the cakes that are in the recipe in the Boutique Baking book. Yes, I agree a lot of faff if you’re not selling or making for a special occasion. The Bronze and gold lustre dust looks great though! I visited her shop in Mayfair last year, they didn’t have these cupcakes available but took a box of others home. £3.50 for one cupcake!…well, that’s Mayfair for you eh! Omg these are devine! Just made a batch for colleagues and couldn’t help devouring the first one myself!! !